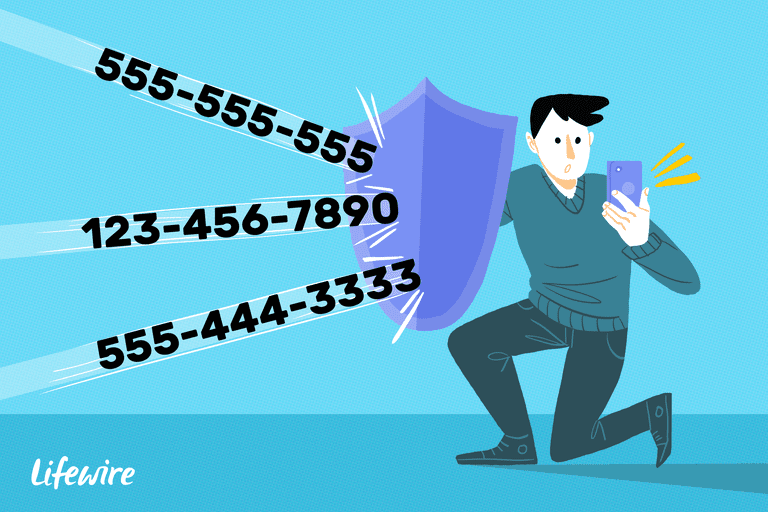 Most smartphones block incoming phone numbers to avoid receiving spam calls or other calls you don't want. Another option available is to block your own Caller ID from displaying on the recipient's device. Sometimes the operating systems hide these features deep in the settings. Further, different carriers offer various options for blocking numbers, so this feature is not always dependent entirely on the OS. All major mobile phone operating systems offer a way to block incoming phone numbers. Tap the "i" icon next to the phone number (or conversation). Select Block this Caller at the bottom of the Info screen. Then, either select a phone number to view its details and select to either add or unblock the number or contact, or add a contact to block by scrolling to the bottom of all blocked numbers and choosing Block Contact. This step launches your Contacts app so you can select whom to block. You can also filter your iMessages from people who are not in your contacts list. After you have filtered at least one message, a new tab displays for Unknown Senders. You still get the messages, but they won't be automatically displayed and you won't receive any notifications. Scroll to and tap Unknown & Spam. Turn on Filter Unknown Senders. Because so many manufacturers produce phones (Samsung, Google, Huawei, Xiaomi, LG, etc.) that run the Android operating system, the procedure for blocking a number can vary widely. Further, versions of Android Marshmallow and older do not natively offer this feature. If you are running an older version like this, your carrier may support it, or you may be able to block a number using an app. Select the number you want to block. On a Samsung phone, tap Details. If your carrier supports blocking, you'll have a menu item called something like "Block number" or "Reject call" or perhaps "Add to blacklist." Tap the vertical dot menu in the upper right corner of the screen. Confirm with a tap on Block. Tap the pencil icon to edit the contact. Depending on your carrier and Android version, you might have to install a separate app to handle call-blocking features. Open the Google Play Store and search for "call blocker." Some well-regarded apps are Call Blocker Free, Mr. Number, and Safest Call Blocker. Some are free and display ads, while some offer a premium version without ads. In addition to controlling incoming calls through call blocking, you can also control whether an outgoing call will display your Caller ID. This capability can be configured to operate as a permanent block or a temporary block on a call-by-call basis. Your phone number can’t be blocked when you call toll-free (i.e. 1-800) and emergency services (i.e. 911) numbers. Just add the *67 prefix before the phone number on your cell phone. This code is the universal command to deactivate Caller ID. For example, placing a blocked call would look like *67 555 555 5555. On the receiving end, Caller ID will usually display “private number” or "unknown." Though you won’t hear or see a confirmation of a successful caller ID block, it will work. Call your cell phone carrier and ask for a line block permanently suppress your phone number in outbound Caller ID. This change is permanent and irreversible. While customer service may attempt to convince you to reconsider, the choice is yours. Various carriers support additional blocking features, such as blocking specific numbers or messages. Though the code to call your mobile carrier can vary, 611 typically works for cell phone customer service in the United States and Canada. If you temporarily want your number to appear when you have a permanent line block in place, dial *82 before the number. For example, allowing your number to appear in this case would look like *82 555 555 5555. Some people automatically decline calls from phones that block Caller ID. In that case, you’d have to allow Caller ID in order to make the call. Most Android phones provide a Caller ID blocking feature in the Phone settings, available either through the Phone app or Settings | App Info | Phone. Some Android versions older than Marshmallow include this feature under an Additional Settings option within your Phone settings. Use the toggle switch to show or hide your number.